I know some people have mentioned an interest in trying out a Dagorhir event, just for the fun of it. It's definitely a different beast. It's a "boffer combat sport" as opposed to a LARP as most of us think of it. There's no "characters" per se. You fight, die, get up and fight again. It's also harder contact than Novitas. It's also a chance to try out a battle on a field with 50+ people per side (at least the event mentioned below is). It's also a chance for some of the Mid-Land veterans to see some old friends. So, what event am I refering to? 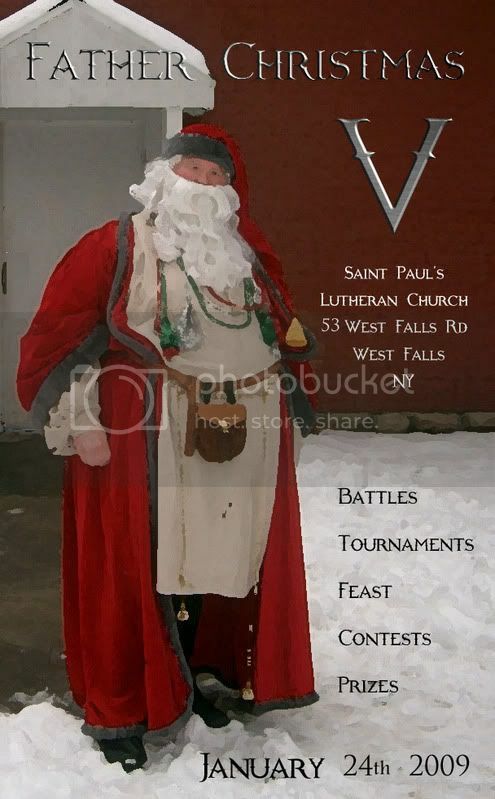 This is a great chance to try something different, broaden your knowledge of the "LARPing world" and meet other LARPers. There will be some loaner weapons available on site (I'll be bringing about a dozen myself) as typical Novitas weapons most likely will not be legal. Novitas shields are absolutely not legal for Dagorhir (shield bashing is allowed). Because the combat is harder hitting, even if your weapons do pass, I recommend not using them as they probably won't last the event. If people want to car-pool from Rochester, I'll have space for a person or two in my car. If people want to crash on the way back home that night, I have space in my house. Feel free to contact either myself of Magnus of Narnia on these forums. It should also be mentioned that there will be limited seats available for the actual feast. I believe there is a limit of 100 people that can be served for the feast, although there is no limit on the number of fighters on the field and there should be table space available for others to eat beyond the 100 for the feast. Just a reminder that this is coming up at the end of the month... I still have space in my car if someone wants to car pool from Rochester.